Ojo Caliente hot springs is the way spas used to be: unpretentious healing oases set atop natural mineral springs. New Mexicans simply call it "Ojo Spa." This hot springs resort (pronounced o-ho cal-ee-en-tay) is an eco-conscious, relaxing retreat from modern life. It offers public and private natural mineral pools, both available for daytime use. Overnight visitors can stay in a spare, mission-like hotel, cottages, suites, and two private homes. Packages and discounts abound. Ojo Caliente's mineral-rich thermal waters have soothed and healed visitors for centuries. The Native American Tewa people discovered the springs and set up encampments there. When settlers from New Spain (modern Mexico) came to what is now New Mexico, they called the springs Ojo Caliente, or Hot Eye. In 1868, Antonio Joseph, the U.S.'s first Territorial Representative for New Mexico, opened Ojo as a resort, the earliest version of the current spa. (Several remaining buildings from 1868 through the 1930s are designated as historic.) 2018 marks Ojo’s 150th Anniversary as one of the oldest natural health resorts in the United States. Ojo Caliente has a glorious setting. The spa is located in the magnificent Chama River Valley of northern New Mexico. It is one and a half hours north of Santa Fe, New Mexico; two and a half hours north of Albuquerque; 45 minutes west of Taos, New Mexico, a gallery and skiing hub; and a half hour south of the Abiquiu home of New Mexico art legend Georgia O'Keeffe. Ojo Caliente Resort offers a wide variety of accommodations: camping areas and RV spots; simple, sunny rooms in the resort's 1917-vintage Historic Hotel; and (the luxury travel choice) a dozen charming adobe suites built in 2008. These six Cliffside Suites and six Pueblo Suites are quiet adobe casitas (cottages) of 500 square feet, with king beds and a kitchenette. Wifi is free, but thick adobe walls mean you have to find the right spot for a signal. The casitas are invitingly decorated in Southwestern style (cowboys and Indians! ), with a New Mexican kiva fireplace, a wood-beamed wood viga ceiling, real Navajo rugs, woven Chimayo wall hangings, and handcrafted wood furniture. The Cliffside Suites also include a private outdoor soaking tub. The entire property is non-smoking except for the parking lot. Apart from Ojo Caliente's campsites and RV area, there is no pet-friendly hotel policy in force. Day-trippers and overnight guests alike come for the healing waters of Ojo Caliente's rich mineral springs, which bubble up into natural stone pools. The communal pools are public and open to spa users and overnight guests. Other mineral pools are secluded, private, and for rent by the hour. One very upscale touch: alongside each private pool is an open fireplace fragrant with smoldering piñon wood. The waters of Ojo Caliente's 12 pools bubble up to the surface at the rate of 100,000 gallons per day. Their mineral composition and temperature vary. All are sulfur-free (no rotten eggs odor here). The iron pool's ferrous-rich H2O bubbles up from the floor and down a waterfall. The soda pool is said to aid digestion. The arsenic pool is a large round swimming pool whose water is believed to heal skin conditions and other disorders. The lithium pool is reputed to relieve depression and indigestion. Ojo Caliente's mud pool, filled with mineral-rich mud that loves your skin, is kid fun for adults. Swimsuits are mandatory (for day use, bring a lock for a locker). Ojo Caliente's natural hot springs are complemented by a full-service indoor spa, The Spa at Ojo Caliente Mineral Springs Resort & Spa. It is consistently ranked as one of the best spas in the Southwest. Its 16 treatment rooms are simply and tastefully designed. 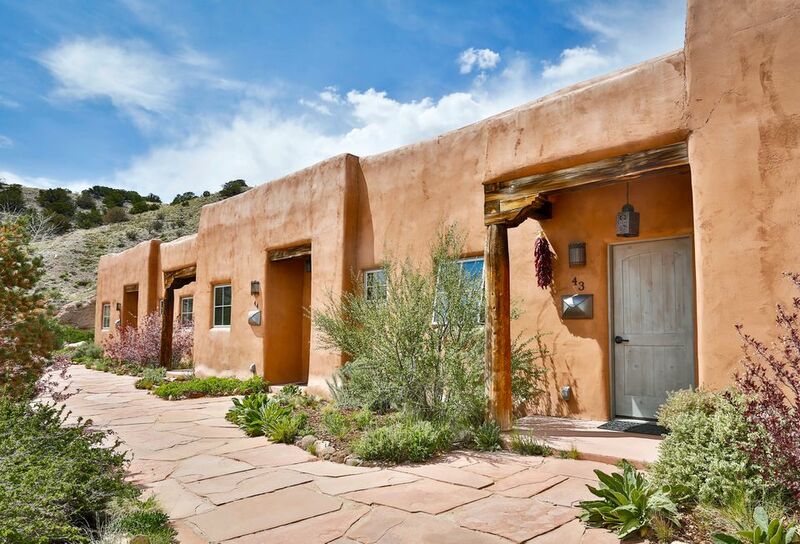 Since the surrounding Sante Fe region is a hub of spas and bodywork, Ojo Caliente spa patrons can expect masterfully performed face and body treatments. Many Ojo Caliente spa treatments incorporate the mineral springs' healing waters. Some also utilize soothing local Northern New Mexico ingredients like prickly-pear cactus fruit, blue corn, and naturally luminous mica powder from an old mine on the adjoining mesa. Among Ojo Caliente Spa's popular and effective signature treatments are the Milagro Wrap, a series of fabric wraps that draw toxins from the body; the Detoxifying Clay Body Wrap; and Ancient Echoes. Dining at Ojo Caliente's Artesian Restaurant, which serves three meals a day, is a high point of a stay or visit. Much of its produce and herbs are farm-to-table, grown on the spa's two-acre farm. Delicious brook trout are fished in the crystal-clear creek that runs past the property. Artesian's seasonal menus are masterminded by a creative chef with a serious kitchen background. Everything is made in-house; the corn bread is a must. Artesian Restaurant breakfasts are hearty; you'll find pleasing dishes like blue corn and piñon nut pancakes, dulce de leche French toast, and house-made maple-nut granola. Lunch and dinner bring many appealing dishes. The menu offers a wider variety of salads than you usually find in New Mexico. Delectable entrees include grilled ruby trout, Wild Isle salmon, and Southwestern enchiladas and fajitas. The Wine Bar & Lounge pours a variety of vintages by the bottle and by the glass, and offers a snack menu. Hard liquor is not served. Recreation and fitness opportunities at Ojo Caliente involve the great outdoors; there's no gym. Most guests seize the chance to hike Ojo Caliente's 1,100-acre property. Its 12 miles of spectacular hiking trails are fully surveyed and marked. They roam over the lush green Chama River valley and up onto a sun-baked ancient mesa bearing Posi Pueblo ruins. Clay shards from age-old tribal pottery dot these grounds, but hikers are prohibited from pocketing them. Ojo Caliente guests can also take advantage of 15 miles of bike paths presenting views worthy of Georgia O'Keeffe, plus daily yoga classes (at a nominal cost to resort guests). Is Ojo Caliente Resort Mineral Springs Resort & Spa right for your Southwestern vacation? The answer is probably yes if: you love mineral springs, thermal springs, rock-formed hot tubs, and outdoor spas; you like staying in a place with history and heritage; you love being outdoors, whether soaking, hiking, biking, or just taking in the sun and stars; you savor spa treatments both traditional and alternative; you could use a lifestyle break from city living or your usual routine; you crave the Wild West look and aroma of New Mexico (a fireplace burning piñon wood); you enjoy channeling your inner hippie or New Ager from time to time. The answer is probably no, Ojo Caliente may not be blissful for you if: you prefer modern indoor spas to rustic outdoor mineral springs; you're visiting Santa Fe, but don't want to drive over an hour to a spa; you absolutely must have a gym wherever you go, even for one night; you are altitude-sensitive (Ojo Caliente sits 7,000 feet high); you're traveling with your pet. Check out the visitors' site for Santa Fe, New Mexico and this passionate eating town's greatest casual eateries.